At the Buffalo Bill Center of the West, the weekend of June 15 and 16 celebrates Plains Indian culture, arts, and music with two major events: the annual Plains Indian Museum Powwow and the long-anticipated opening of the Paul Dyck Plains Indian Buffalo Culture Gallery of the Center’s Plains Indian Museum. This marks the 32nd year of the Plains Indian Museum Powwow, the Center’s longest-running public program. 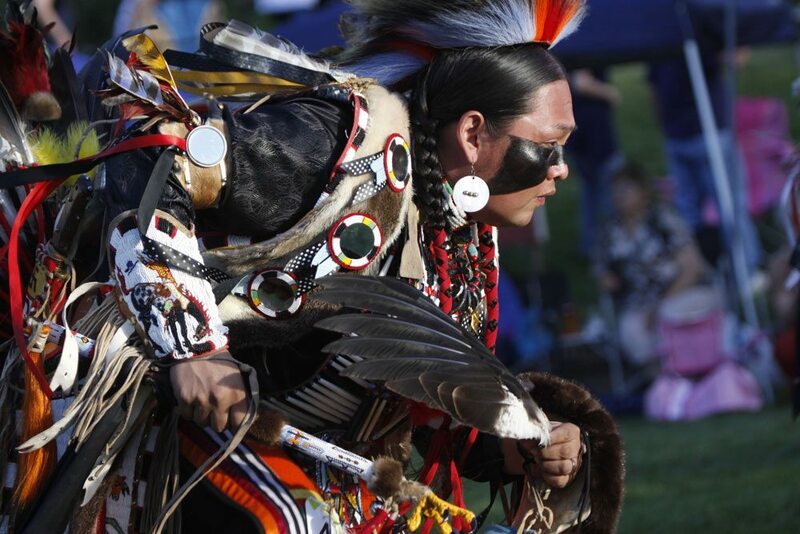 The Powwow brings together Native dancers, drum groups, families, and artisans to share the Native cultures of the Great Plains. Lakota educator Gloria Goggles offers hands-on activities about powwow dance, etiquette, tradition, and song at the popular Powwow Learning Tipi. More than 40 vendor booths of authentic, handmade Native arts, jewelry, and photography are on hand, as well as fry bread and Indian taco concessions. Sheldon Shebala, Plains Indian Museum Powwow dancer. Photo by Ken Blackbird, 2012. Grand Entry ushers all participants into the powwow arena at noon and 6 p.m. on Saturday, June 15, and at noon on Sunday, June 16. After a welcome and opening prayer, host drum Arapaho Nation from Arapahoe, Wyoming, sing flag and victory songs. Competitive dancing begins after the posting of flags by color guard Apsáalooke Nation Guard from Crow Agency, Montana. Arena Director is Charlie White Buffalo, and Master of Ceremonies Robert “Corky” Old Horn announces from the stage and makes it easy for visitors to follow the action. Dancers range in age from tiny tots (children under 6) to golden age (adults 55 and older). Dance categories include traditional, grass, and fancy for men and boys; and traditional, fancy shawl, and jingle for women and girls. This year’s specials include gourd dancing, tiny tots, women’s fancy shawl, men’s traditional, men’s chicken dance, and team dancing. Tickets for Powwow may be purchased at the Robbie Powwow Garden on the southeast corner of the Center’s grounds the days of the event (good for one day only). Gates open at 9:30 a.m. Advance tickets are available beginning June 10 at the Center’s admissions desks. Tickets: $10 for adults 18 and older; $5 for youths 7 to 17; free for children 6 and younger; Center members receive a $1 dollar discount with presentation of their membership card. Ticket prices are separate from Center of the West general admission. The Powwow Garden is an outdoor grass amphitheater with limited bleacher seating; visitors may bring lawn chairs or blankets. This year’s Powwow is sponsored in part by Dan and Mary Armour; Choice Aviation of Cody, Wyoming; and Hal and Amalia Ramser. This year’s Powwow coincides with the opening, at 8 a.m. June 15, of a new gallery dedicated to the display of the Paul Dyck Plains Indian Buffalo Culture Collection in the lower level of the Plains Indian Museum. The collection, which includes masterworks from the early 1800s, has long been recognized by scholars and collectors as the most historic and important privately held collections of Plains Indian art and related materials in the world. The new gallery features more than 80 objects from this extraordinary collection. The Paul Dyck Collection was acquired through the generosity of the Dyck family and additional gifts of the Nielson Family and the Estate of Margaret S. Coe. For more information on the collection, Powwow, and the Center’s other events and exhibitions, explore centerofthewest.org.